Today we launch Basecamp Mobile for phones and devices with WebKit browsers. This includes the iPhone 3GS, iPhone 4, iPad, Motorola Droid X, Motorola Droid 2, Samsung Galaxy S, HTC Incredible, HTC Evo, Palm Pre 2, BlackBerry Torch, or any other device running iOS 4+, Android 2.1+, webOS 2, or BlackBerry 6. Basecamp Mobile is not a native app, it's a web app. All you have to do is visit http://basecamphq.com on your mobile phone. No apps and nothing to install - it just works. More details on the launch at Signal vs. Noise. 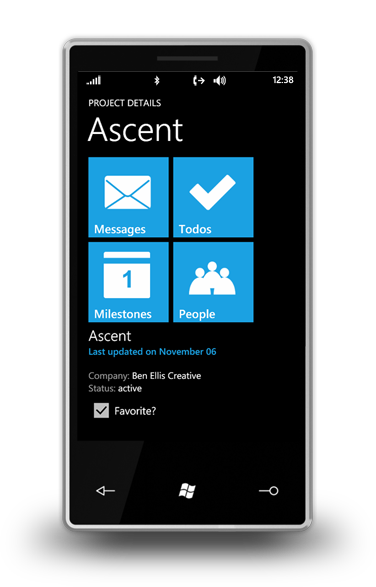 Ascent is a Windows Phone 7 mobile client for Basecamp. With Ascent, you can create and edit milestones, to-do lists, and comment on project items. It costs $3.99. 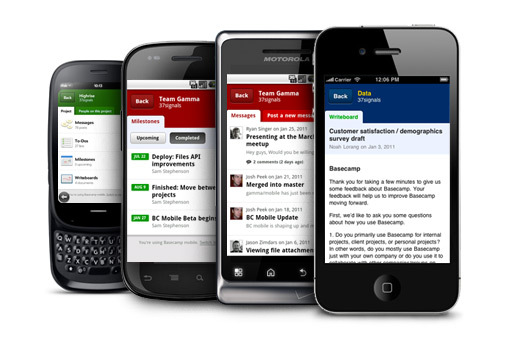 Bryte Software's Kompass is a universal Basecamp portal for the BlackBerry Smartphone, iPhone, Palm Web OS, Windows Phone 7, and Android. According to Adam Carlan, founder and CEO of Bryte Software, their goal is "to develop a solution for all mobile devices that allows team-members to effortlessly collaborate via Basecamp through a single application". Because it's a mobile web app there's no need to download, install, or update software. Any smartphone with an internet connection can immediately use Kompass integrate with Basecamp in real-time. I personally had a huge need to access my to-do lists, milestones, and messages on my Blackberry. I was surprised to discover that there was not a single optimized Basecamp interface for Blackberry. The only mobile solutions that did exist were for other devices, and each application had their own methods of navigation. So, I envisioned a mobile solution that would bring instant availability, consistency, and real-time access to Basecamp across all mobile devices throughout my entire team. That idea grew into what is now Kompass for Basecamp. Now that Kompass is in free beta, project managers will no longer have to face the same challenges that I did. Now, I feel we've built the standard for mobile access to Basecamp. Kompass is currently in free public beta. If you don't already have a Kompass account, you can sign up by visiting http://kompasshq.com and registering. According to Carlan, you'll be up and running with Kompass in less than 2 minutes. Summit is an iPhone app that lets you manage your Basecamp to-do lists, milestones, comments and messages on the go. Summit creator Andy Smart is releasing an update today (1/26/11) and sent us a note about it. Summit will be $1.99 (50% cheaper) for a limited time, making it the cheapest full Basecamp client in the store. Summit at the iTunes App Store. Attention Highrise users: PowrFone's SmartPhone Screen-pop (TM) for iPhone provides a screen-pop of customer data gleaned from Highrise. A few seconds before the call reaches your iPhone, a push notification will pop up on your iPhone. The screen-pop provides a full display of caller name, phone number, deal, next task, and tags so you're prepared to take the call or forward to voicemail. Follow these steps to sign up. Bridge is a subscription based BlackBerry application that "enables synchronization and convenient online and offline access to Highrise." 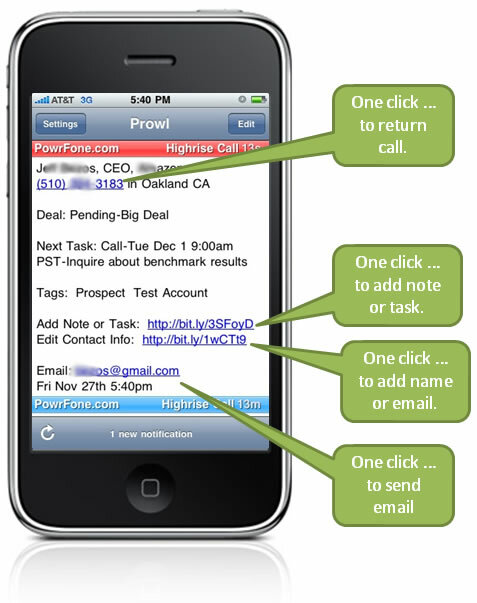 User interactions are geared towards adding notes and triggering communication with contacts. 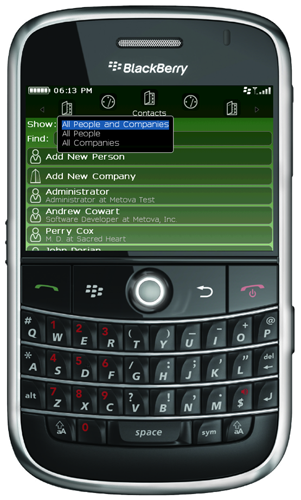 While full editing and viewing of history etc are available, all interactions were tuned to require the smallest number of user interactions to provide the best user experience possible for a BlackBerry user.